Prior to last year’s local elections in Queensland, Australia last year, it was reported that a study outlining the viability of a new HELE coal-fired power plant was buried by the incumbent government, because, the opposition party argues, it didn’t fit their election agenda. The furore highlights the political baggage now attached to new coal power in Australia,; but could ideology hinder common- sense decision-making around the growing need to provide affordable and reliable energy? Rally at Victorian state parliament in Spring Street on Wednesday 1st February 2012 against the proposed coal-fired power station for Victoria. Credit: Flickr / Takver. 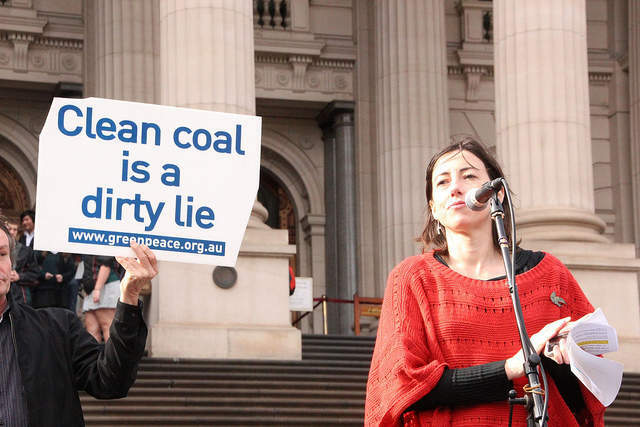 A protester holds the sign 'Clean coal is a dirty lie' outside Parliment. Credit: Flickr / Takver. The decommissioned Hazelwood power station, Gippsland, Victoria. Credit: Flickr / Montash University. The market favours investment in renewables over coal-fired power in Australia. Credit: David Clarke (Brown Hill Range wind farm). A few weeks prior to polling day in Queensland in November 2017, the opposition party accused the incumbent Labor Government of purposely withholding an Energy Department-commissioned report into the building of a new high-efficiency / low-emission (HELE) coal-fired power plant in the state. State Energy Minister Mark Bailey dismissed the report, saying it ‘lacked basic considerations and was not taken seriously’. During the election campaign, which was eventually re-won by the Labor party, the LNP opposition party vowed to champion a new 800MW ‘ultra-supercritical’ coal-fired power station to be built by private investors. “Coal-fired power is politically sensitive in Australia because it involves balancing the environmental, affordability and reliability trilemma; with coal, you essentially get cheap, reliable power but at an environmental cost,” says Matt Rennie, an energy sector specialist at EY Australia. Last year, a similar situation to that in Queensland unravelled in the neighbouring state of New South Wales, with some political parties pushing the Premier to use public funds to build a new coal-fired power plant, which she opposed. There are clearly mixed opinions about whether more coal-fired power plants are the answer to Australia’s ongoing energy woes. ABC news reported that a former power company executive, Chris Walker, said the LNP’s plans in Queensland were akin to an idea conceived by “guys in a bar who have had too much to drink”. Whereas, Prime Minister Malcolm Turnbull touted the project as a candidate for federal funding via the Northern Australia Infrastructure Facility. However, a Lowy Institute survey of 1,202 adults last year found 81% of respondents wanted policymakers to focus on clean energy sources, such as wind and solar, even if it costs more to ensure grid reliability. Australians, both in and out of politics, may be keen to reduce their reliance on coal, but the complexities of the country’s energy market make it a hard move. “There are some difficult choices ahead due to the economics of power generation in Australia,” says Rennie. Is coal the only way to go? It’s not just politicians that are going cold on coal, but financiers, too. In December, the National Australia Bank, one of the four largest financial institutions in Australia, said it will stop financing new thermal coal power plants, sending a strong signal to the financial sector about the future of coal in the country. A few weeks before, the Australian Prudential Regulation Authority (Apra) warned banks, lenders and insurers that a lack of assessment of climate risks has already started affecting the global economy. It added that, if the Australian financial sector does not further the incorporation of climate risks into its investment strategies, Apra will consider establishing a binding regulatory framework. The LNP proposed HELE coal plant would take seven years to build; in that timeframe, to invest, financers would need a strong signal from the government that coal will still be on the agenda for decades to come. Rennie says the government’s new National Energy Guarantee established in October last year, which prioritises reliability and affordability obligations, along with emissions reductions, is a good first step to opening up discussion on new coal. They’d also have to get past the state-level political blustering first. Public opinion would also need to be won over. However, ultimately, Rennie thinks the public will favour whatever makes their energy bills cheaper in the long term. Furthermore, if reliability becomes a major issue, as it did in South Australia last year after several large-scale outages, that could cement the case for new coal.